A chemistry science lesson on the elements. An elementary chemistry and science teaching lesson on the periodic table and chemical elements. Includes printable teaching worksheets. Interpreting the periodic table, identifying elements, writing, research skills, visual and oral presentations, cooperative learning skills. (Students can do this project with other topics, such as minerals). 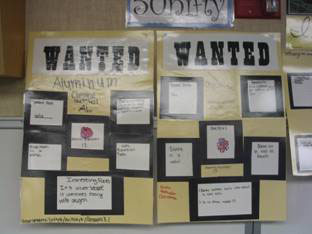 After reading about the periodic table, students will be able to identify, name, and interpret chemical elements on the table by creating a WANTED poster for an assigned element and presenting the poster to the class. This model served as a reference for students as they created their posters. Engage the students by first reading from an interesting book about the chemical elements and periodic table. To see if students can interpret the table, give them an element and ask if it is a metal, non-metal or metalloid. Give students an atomic number and ask them to identify the element. Explain to students that elements have varying states: solid, liquid and gas. Ask students the state of elements such as oxygen (gas) and silver (solid). 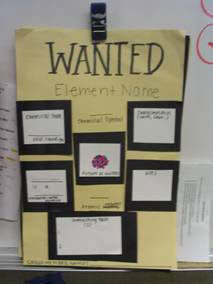 Tell students that today they will be creating a WANTED poster for a specific element. Assign or allow students to form groups of 3 to 4. Once students are in groups, pass out one Chemical Elements Graphic Organizer and one photocopy of the periodic table to each group. Students can choose an element out of a hat, play pin the tail on the element, or just be assigned an element to do their project on. Tell students that everyone in the group must have a job to do (researcher, recorder, artist, etc.). Encourage students to use cooperation and to delegate jobs. Explain to students that they will present their poster to the class. All students in the group must speak during the brief presentation (see rubric for grading). The finished posters were laminated and displayed on the wall. At the conclusion of the presentations, have students share with a partner a new fact that they learned from this project. Print this chemical elements worksheet for this lesson plan. Print this chemical elements rubric for this lesson plan.